SYDNEY (Reuters) - Britain's Prince Harry and his wife Meghan touched down in Fiji on Tuesday for the first royal visit to the South Pacific nation since a military coup 12 years ago saw it suspended from the Commonwealth for eight years until democratic elections. 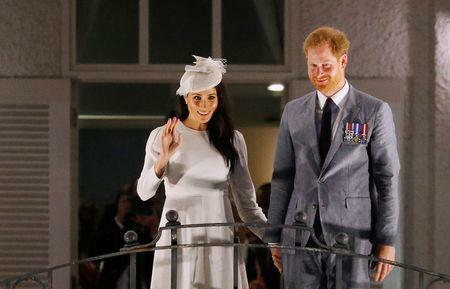 Thousands of men, women and school children lined the route of the couple's official motorcade into central Suva, with many spectators smiling, waving and holding up handwritten signs. Fiji is due to hold elections on Nov. 14, with Bainimarama's Fiji First party favored to win over an opposition led by Sitiveni Rabuka, who himself led the country's first military coup in 1987.